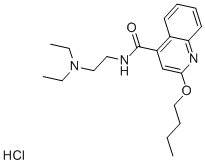 Dibucaine Hydrochloride is a local anesthetic of the amide type now generally used for surface anesthesia. Target: Sodium Channel Dibucaine is an amide local anesthetic. Dibucaine reduced the degradation of BSA-gold complex in the reservosomes, which was not caused either by an inhibition of the whole proteolytic activity of the parasite or by a reduction on the expression levels of cruzipain .